Here is a perfect recipe for the mushroom season, very simple and fast to cook. You can use all type of mushrooms. 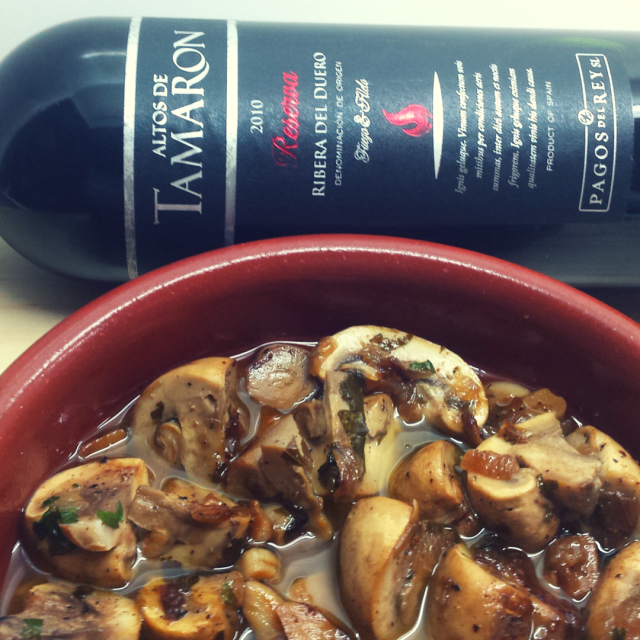 Excellent dinner dish for red wine from Ribera del Duero like Altos de Tamaron Reserva. Open the bottle of Altos de Tamaron reserva and let it open in a fresh area, while you cook. Clean and cut the mushrooms. In a frying pan, put 2 table spoons of olive oil, the onion previously cut in small dices and the garlic previously cut in thin chops. Fry for some seconds. Add the mushrooms and the white wine, salt and let it fry for 2 minutes. Move a couple of times. Add the ham and persil and move for a couple of times during 1 minute. Food is ready to serve with a red glass of Altos de Tamaron reserva.